← Brush of Darkness Jewelry! I’m over at Word Whores today talking a little bit about kissing (along with a little excerpt of Brush of Darkness – Abby and Brystion’s first kiss in the book yay). Also, special thanks to everyone supporting the jewelry effort – it’s definitely appreciated! 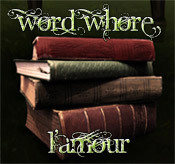 This entry was posted in blog and tagged giveaway, guest post, word-whores. Bookmark the permalink.